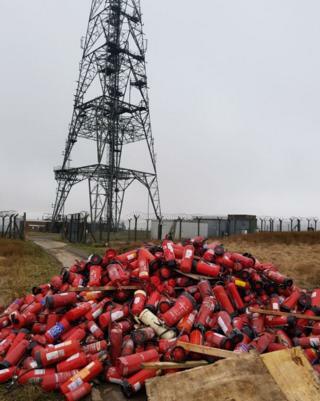 Dozens of fire extinguishers have been dumped on a Pennine hill near the M62. They were left next to a transmitter on Windy Hill, above junction 22 of the motorway near the border of Greater Manchester and West Yorkshire. West Yorkshire motorway patrol officer PC Martin Willis tweeted a photo of the fly-tipping. One commenter said they could be easily traced via information on the inspection labels. Councillor Neil Emmott, Rochdale Borough Council's cabinet member for environment, said: "We have received a report of a number of fire extinguishers being dumped on Windy Hill. "We investigate all complaints of fly-tipping and won't hesitate to take action against those responsible."